I do. And I have done for quite a few years, originally to avoid that post-work what’s for dinner panic, and now to avoid the post-grizzly all-day teething-baby panic (have I used too many hyphens there?). I’ve fallen in and out of the habit over the years but I’m much happier and feel vaguely organised and on top of things when I manage it. I use a mix of old favourite recipes, new from books, new from pinterest and at least one day of leftovers from the freezer or fridge. I try to have at least one meat-free and one fish day. And I try to use ingredients up instead of buying different vegetables for each dish. I usually have a slow cooker recipe too as I love being able to chuck everything in the pot during nap time and then leave it well alone. I used to write the lists down but I use the Notes app on my phone now along with a note of which book the recipe is in and write the shopping list directly under it, ready to take to the shops (and I delete each item as I move around the store). I only do dinners but I should probably add breakfast, snacks and lunch to be even more organised. Let’s not go over the top hey? So, in the spirit of sharing, here’s this week’s plan. It’s actually all new-to-me recipes this week, no favourites, which is ambitious of me! Monday: Korean Tilapia with baby Bok Choy (via pinterest). This was amazing! Will definitely be making it again. Tuesday: Black bean cakes (p 224 weelicious cook book and online here) with broccoli and greek yoghurt. Emily loved the bean cakes. Mummy was pretty enamored with them too. Wednesday: Green macaroni and cheese (another weelicious online recipe) a delicious way of adding more greens to our diet. Friday: Leek & chive flan, smoked salmon, asparagus, sweet potato (recipe via French Foodie Baby) well Ben and Emily weren’t too impressed with the flan but I loved it. Maybe I’ll try it again with different flavours. Sunday: roasted chicken thighs with clementines from Jerusalem cook book (also online here). 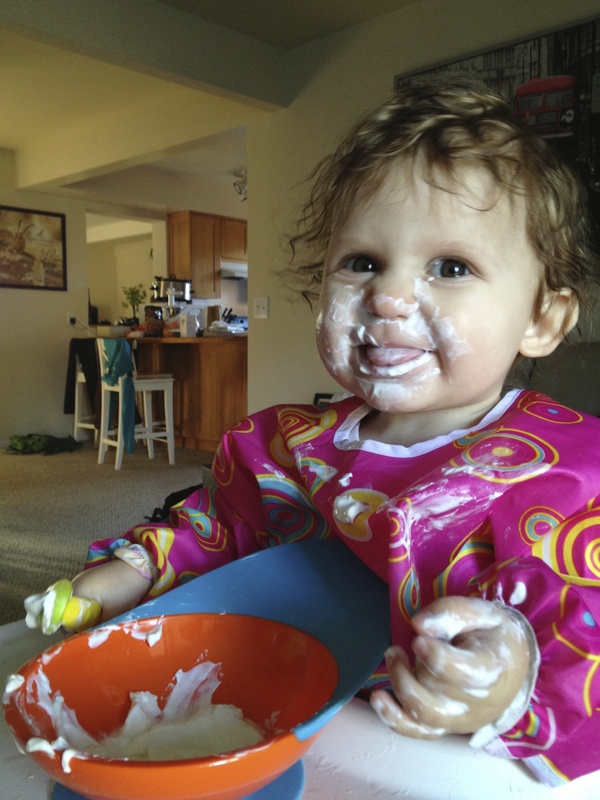 And finally, to illustrate this post, here is a photo of Emily tucking into her greek yoghurt. She likes to paint with it whenever possible and use it as a facial and hair treatment. Apparently it’s good for the eyelashes too. Who knew?